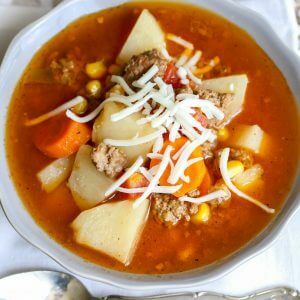 Hearty and delicious Hamburger Soup filled with corn, carrots, potatoes, cheese and more! Best of all, it's made in the crockpot with minimal effort, making it the perfect soup recipe for a busy fall day! Add carrots, potatoes and water to your crock pot. Cook on low for 3-4 hours (or HIGH for 1.5 - 2 hours). Brown beef and add beef and remaining ingredients to crock pot. Cook on low for another hour or HIGH for 30 more minutes. Add 1 cup cheese a few minutes before serving. ENJOY!